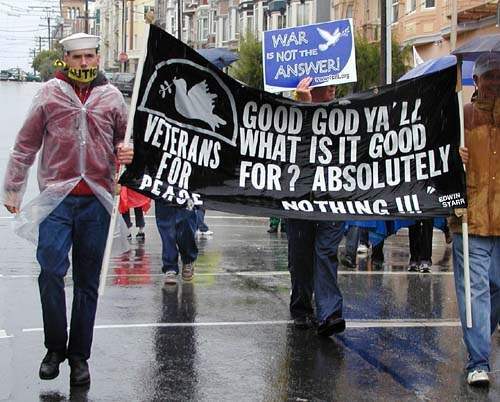 Antiwar Activism: Queers & Veterans Unite! Note about upcoming Veterans for Peace convention in San Francisco. Veterans for Peace (http://www.veteransforpeace.org/) is holding its annual convention in San Francisco this year. One of the breakout sessions scheduled on Aug. 8th is "Joining Anti-War Activism with Struggles for Justice (Building a Multiracial Veterans' Movement)". Encourage them to join their anti-war activism with the lesbian, gay, bisexual, and transgender struggle for justice. There could hardly be a better place than San Francisco for them to do it.